Description: A medium sized goose with a black chest, neck and head, and a white face. 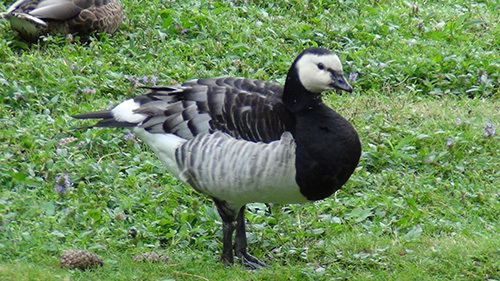 The black neck and head give the barnacle goose the appearance of wearing a hood. The back is silver-grey and the sides a pale grey while the belly and rump are white. Mature birds weigh up to 1.8 kg (4lbs) with a wingspan of 1.4 m (4.5 feet), males are slightly larger than females. 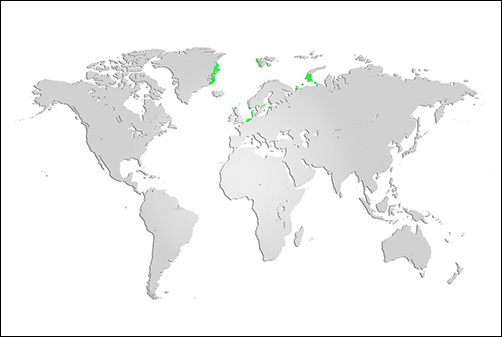 Distribution and Habitat: Barnacle geese are native to the North Atlantic and are found in Greenland, Norway and Russia with wintering grounds in Ireland, Scotland, Germany and the Netherlands. They are an occasional visitor to Eastern North America but do not breed here. Diet: Mostly herbivorous, feeding on the plants and grasses of coastal wetlands like salt marshes, tidal mud flats, and estuary grasslands. Life Cycle: Small colonies of barnacle geese nest high on cliffs for protection from predators. Clutches of 4-6 eggs are incubated for 25 days. Fledglings reach maturity after 40-45 days and reach sexual maturity at 3 years. Did you know? Like all geese, barnacle geese do not bring food to their young, but bring their young to feeding areas. Although protected from falls off cliff ledges by their light weight and downy feathers, some do sustain injuries, attracting arctic foxes to take advantage of the opportunity.